During an appearance on ABC’s This Week, Republican Representative Jim Jordan of Ohio defended and deflected criticisms of President Donald Trump and speculated that Special Counsel Robert Mueller’s investigation into Russian interference wouldn’t be the “bombshell” Democrats were hoping for. The investigation’s final report, which was submitted to Attorney General William Barr on Friday, has not yet been seen by lawmakers, including Jordan. Senior members of both parties have pushed for the investigation’s findings to be made public, with many Republicans contending that the report will exonerate Trump. “We’ve got to read the report, but what I do know is that to date, not one bit of evidence to show any type of coordination, collusion, conspiracy between the Trump campaign and Russia to influence the election,” Jordan said. Host George Stephanopoulos then cited evidence that 14 associates of Trump had more than 100 contacts with Russian nationals and asked if that concerned Jordan, who didn’t respond to the question directly. Instead, he noted that lawmakers on both sides of the aisle had confidence that Mueller would be able to carry out the investigation and sleuth out facts. Jordan later deflected when asked if he was bothered by payments the president’s former fixer, Michael Cohen, made to women who alleged they had affairs with Trump. Those dealings are the subject of a separate investigation in the Southern District of New York. “So, just to be clear, the president’s involvement in those hush money payments doesn’t concern you?,” Stephanopoulos asked. 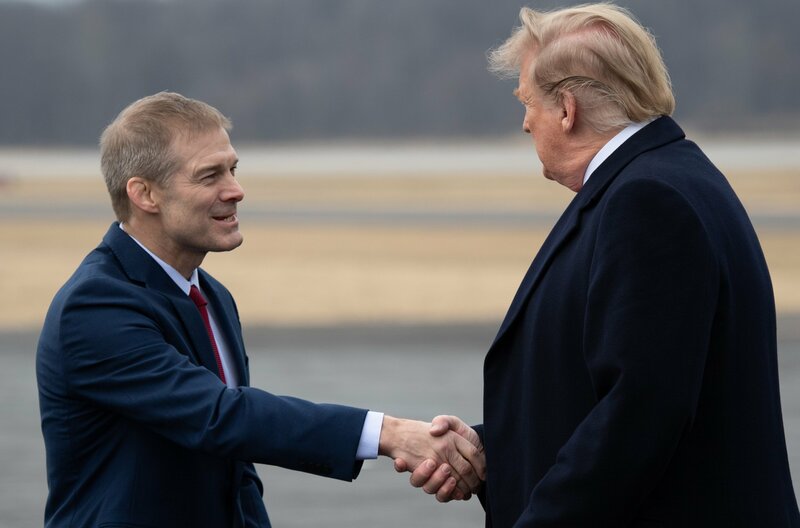 Jordan, one of Trump’s closest allies and the top conservative on the House Oversight and Reform Committee, largely reiterated his previous statements of support throughout the appearance. The Ohio lawmaker has been highly critical from the outset of Mueller’s investigation, which lasted 22 months and netted 34 indictments of both Russian nationals and people from within President Donald Trump’s inner circle. The charges include hacking emails, lying to investigators and financial crimes, among others. It’s now up to Attorney General Barr to decide which parts of Mueller’s report will be made public. In his letter to Congress on Friday, he said further developments could potentially come in the next few days. “I am reviewing the report and anticipate that I may be in a position to advise you of the Special Counsel’s principal conclusions as soon as this weekend,” Barr wrote.